Posidonius was a major intellectual figure of the Hellenistic world whose interests and contribution spread over the whole intellectual field: philosophy, history, the sciences. His writings are of interest not only to philosophers and classicists, but also to historians and history of science. His work survives only in fragments. The text of these fragments, collected and edited by L. Edelstein and I. G. Kidd, was published in 1972 (Vol. I The Fragments), with a second edition in 1989. This collection, along with Vol. II The Commentary by I.G. Kidd (1988), has become established as the definitive modern edition. However, many of the fragments are extremely difficult to translate, and this volume of translations has been compiled to make this interesting material more easily accessible to scholars and students. The translations are accompanied by contextual introductions and explanatory notes where necessary. 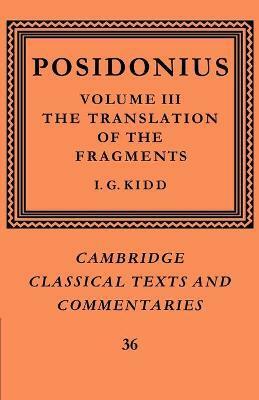 An Introduction summarises the importance of Posidonius and his work. Part I. Testimonia: Life and influence; Characteristics of Posidonius' philosophy; Doubtful testimonies; Part II. Fragments and Titles of Named Books: Physics; Ethics; Logic; Sciences and history; Doubtful fragments; Part III. Fragments Not Assigned to Books: Divisions and Content of Philosophy; Physics; Ethics; Logic; Sciences; History; History of philosophy; Miscellaneous; Indices. "...an enjoyable read in themselves, as they open up a panoply of thought and give us amazing insight into the philosophical milieu of the Augustan and later ages." W. G. Sayles, The Celator "The success of this project cannot be overstated. It has transformed the study of Posidonius and later ancient thought in a decisive manner, especially in the English-speaking world." Brad Inwood, Bryn Mawr Classical Review "It wiil be a welcome and valuable reference for those investigating many aspects of ancient thought,especially for those interested in the history of science, historiography, and philosophy." Arthur Marmorstein, Religious Studies Review "Kidd, academia's preeminent authority on Posidonius, advances his reputation still further with this translation...The introduction alone makes the book worth owning, but this volume delivers much more...The translation is a valuable tool to anyone interested in Posidonius, Stoicism, and the intellectual life of the first century.